Groome and McCombie's JN-4 Canuck - the first airplane in Canada to be licensed for commercial purposes. The sign on the side of the building behind the plane reads: " Aeroplane Ride over city. Flights At Any Time. $10.00"
The first experiments in aviation in what would become Saskatchewan took place in the early 1890s, when William Wallace Gibson wondered if the kite he often flew could somehow be mated with an engine. Gibson maintained his interest in this subject. After reading of the Wright brothers' successful 1903 flights he accelerated his experiments by launching a large paper glider from the roof of his Balgonie hardware store in June 1904, and also designed a man-carrying machine and a gasoline engine to power it. These Saskatchewan experiments bore fruit on September 8, 1910, when Gibson (by then living in Victoria) flew his “Twin-plane,” the first aircraft designed and built in Canada, and powered by a Canadian-designed engine. Although a few Saskatchewanians also built flying machines, the first powered flight in the province was made on May 19, 1911, when American barnstormer C.W. Shaffer flew his biplane over Saskatoon; he made another flight in Regina on August 5. Desultory experiments by aviation enthusiasts and summer flights by touring aviators made up the extent of flying in Saskatchewan for the next eight years. The end of World War I saw the return of military pilots and ground crew, notably Roland Groome, who gained a place in Canada's aviation history in the spring of 1920 when the federal government's new Air Board, which was traveling across western Canada, issued Canadian commercial pilot's licence No. 1 to him. Groome's business partner, Robert McCombie, received aero engineer's licence No. 1; their airfield (in Regina's Lakeview district) became Canada's first licensed “air harbour”; and their Canadian-built JN-4 (Can) Canuck was registered G-CAAA - the first licenced aircraft in Canada. An airport in Saskatoon received licence No. 2. Aviation in Saskatchewan waned as the 1920s passed; but in 1927 the federal government, wanting a pool of trained aviators, offered light aircraft to flying clubs across the country. Thus were formed clubs in Regina, Moose Jaw and Saskatoon, setting the stage for sustained development. 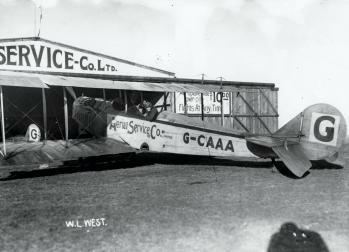 The two former clubs co-operated with Western Canada Airways in the first prairie airmail service; members of Saskatoon's Aero Club formed M&C Aviation, a northern air service headquartered in Prince Albert. Saskatchewan flying clubs nurtured two other enterprises. Prairie Airways, an airline organized by Moose Jaw Flying Club members, began operation in 1934 and four years later bought two Beech 18 airliners for north-south routes in the province. In Regina, the RCAF's 120 (Auxiliary) Squadron, was recruited mostly from Regina Flying Club members; its role was training ground crew and aircrew - presaging one of Saskatchewan's most important contributions to the Allied effort during World War II, as it was home to twenty training schools under the British Commonwealth Air Training Plan (BCATP). Though some existing airports were used for BCATP schools, most were created from scratch during summer building campaigns in 1940 and 1941. As had happened after World War I, the arrival of peace in 1945 brought a boom in the innovative use of aircraft. The provincial government in 1946 started an Air Ambulance service that used specially equipped aircraft with trained crews to take patients to Hospitals. To develop the northern half of the province, the government purchased M&C Aviation to create Saskatchewan Government Airways (SGA) in 1947. SGA was a Crown corporation that operated scheduled and charter services in the north, and also recruited “smokejumpers,” specially trained men who parachuted to fight forest fires. In the private sector, the postwar years saw the use of aircraft for recreation, transport, and specialized purposes like pipeline/powerline patrol and the application of agricultural chemicals. Trans-Canada Airlines (TCA), serving Regina since 1939, upgraded its service with new aircraft and started service to Saskatoon in 1947. Canadian Pacific Airlines flew between Regina and Edmonton. In 1947, Saskatoon became home to an RCAF auxiliary, or reserve, squadron, and from 1951 to a military air training school. A parallel school was created in 1952 at Moose Jaw, which two years later was the site of the worst aviation accident, to that point, in Canadian history: on April 8, 1954, an RCAF Harvard trainer collided over the city with a TCA North Star, killing 31 passengers, the TCA crew of four, the Harvard's pilot, and a woman on the ground. The military air base at Moose Jaw gave birth in 1970 to an air demonstration team called the Snowbirds. Operation of the base itself was taken over in 2000 by a civilian consortium headed by the Bombardier aerospace group, though military personnel remain as instructors. Crone, R. 1975. “Aviation Pioneers in Saskatchewan,” Saskatchewan History 23: 9-28; Holman, R.F. 1995. Best in the West - The Story of Number 2 Canadian Forces Flying Training School and Flying Training In Canada. Moose Jaw: Big 2 Fund.